Polestar engineers spend months over the winter offseason struggling to squeeze a few extra tenths of a second per lap out of their cars. One of their most valuable tools is MSC Software’s Adams/Car which they use to evaluate different vehicle designs in critical areas of the track such as the corners. In the past Polestar used hand calculations and spreadsheets to perform some very rough estimates of vehicle performance to attempt to select the best designs for testing. “These tools provide some value in sharing knowledge but contribute little towards predicting the performance of a prospective design,” Blomberg said. 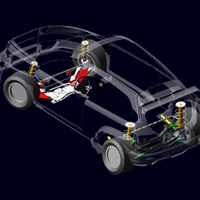 “We have long used simulation at the component level to, for example, evaluate stress and deformation in suspension components, but we were not aware of the possibility of predicting the performance of the complete vehicle until the MSC representative introduced us to Adams/Car.